Speed-riding is a kind of winter practice paragliding that is a combination of mini-sailing and skiing. The enjoyment lies in the feel of gliding between the air and the snow, and moving between these two elements. 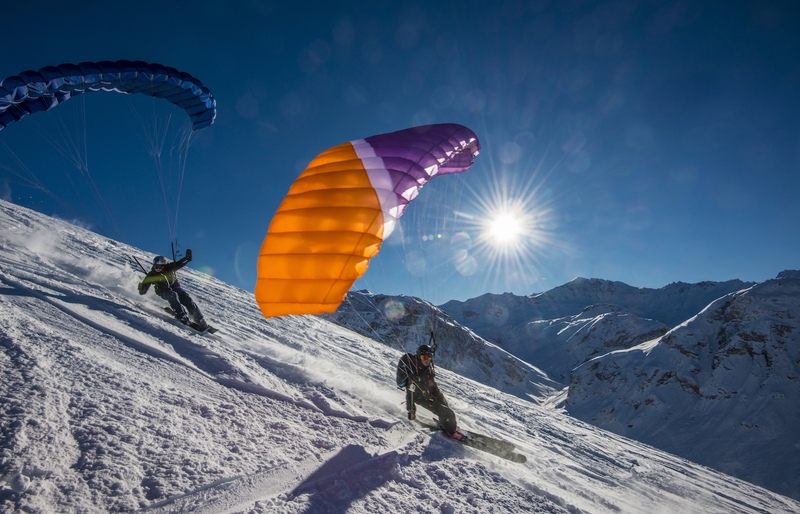 The speed-riding wings are “mini paragliders” that make it possible for you to follow the contours of the slope and exploit the terrain as you enjoy good or less good snow conditions. The advantage of this is that you adapt the practice to the snow, enjoying the best sensations. The potential for fun and excitement is varied and considerable, even on beginners’ terrain. It’s a bit like a game in which the initiate decides how to interact with the elements, and it is easy to pick up speed, or even jump 30-metre high bars! In fact, the mini sail gives skiers extra lift – they actually grow wings! This kind of discipline is if anything better suited to good skiers than to good paragliders. This is an ideal activity for the mountain: it is accessible and easy to set up since the sail is small in size as well as lightweight making it easy to carry. You’re also guaranteed to have fun whatever the meteorological conditions might be. These are delivered during the winter to anyone regardless of whether they are practicing paragliders. You need to have reached a good level of skiing, as you can only speed-ride on off-piste terrain. You have to be able to parallel-ski in unprepared snow. Terrain: Slight slope to steep slope. Equipment: sail area of ​​16 m2 to 11 m2. We offer 3 packages for people interested in getting into this winter sport that is fun, and guaranteed to deliver unique thrills! A student holding an FSVL paragliding license can get their speed-riding extension by taking this course. The courses are adapted to each student’s level, in line with the paragliding and skiing experience.